Welcome to the Diamondhoops.com website (the "website"). We recommend that you read this section each time you use the website since any changes to the Terms and Conditions will be posted here. Your use of this website, whether by browsing, activating an account, making a purchase, or any other manner constitutes your agreement to the terms set forth below and all other disclaimers, policies, guidelines, and terms and conditions that appear on this website under the "Policies" Section (collectively defined as the "Terms and Conditions"). All rights not expressly granted herein are reserved. Diamondhoops.com reserves the right to make changes to the website and the Terms and Conditions from time to time without any prior notice. All of our merchandise is new or like new and is sold on an as is, where is, basis. All jewelry descriptions and carat weights are approximations. Mounted semi-precious and precious stone(s) is/are graded only insofar as mounting permits observations. Colored gemstones (rubies, sapphires, and emeralds) are generally treated to enhance their appeal. Many of these enhancements may not be permanent or may require special care and/or maintenance. Diamondhoops.com is not responsible for this care and maintenance. Diamonds are natural and untreated unless otherwise stated. The weights stamped on the Items/Labels/Tags/Invoices are in carats and are approximate. The range for each weight listed is in accordance with FTC guidelines as follows: 1.00 or 1ct = .95 up, 75 or ¾ = .70 up, .50 or ½ = .45 up, 40 or 3/8 = .37 up, .33 or 1/3 = .29 up, .25 or ¼ = .22 up, .20 or 1/5 = .18 up, and up to 8% less for other size ranges. We are not responsible for the estimated weights on our closeout merchandise – they are our best conservative estimates. Discrepancies found in weight, price, count, or terms must be reported and resolved within fifteen (15) days of Invoice Date in writing. We will strive to make sure our data is accurate and complete, however, there will be instances when information contains typographical errors, inaccuracies or omissions that may relate to product descriptions, pricing, availability and other matters. Diamondhoops.com does not guarantee the accuracy, integrity, completeness of the content and cannot be bound by such information, including any verbal or written advice obtained by you from us directly or through this website. Diamondhoops.com does not warrant that the content of this website is applicable or in accordance to laws outside the United States. Diamondhoops.com will attempt to display Merchandise as accurately as possible. We cannot guarantee that the color on a customer’s screen will match the color of an item since the display of color partially depends upon a customer’s monitor and its calibration. However, you have the right to return any item with which you are dissatisfied within 15 days from the Invoice Date. For more information please review our Return Policy. 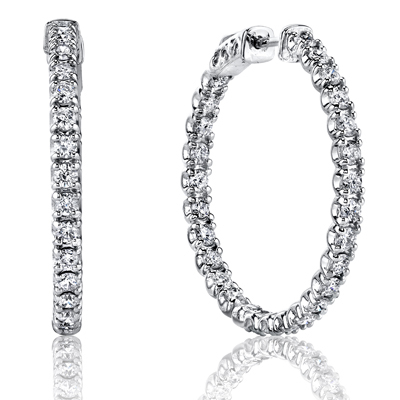 Many of Diamondhoops.com’s pieces are in limited quantities or one of a kind. The availability of all of our items is subject to prior sale. We will attempt to remove an item as soon as possible after it is sold from our website. We do not guarantee an item is in stock or will be in stock in the future despite it showing as available for order on our website. Feel free to contact our Customer Service if you cannot find an item from a previous visit or have questions regarding the availability of an item. Please note that we do not place any items on hold and reserve the right to refuse or cancel orders placed at any time. All prices displayed on Diamondhoops.com’s website are in US Dollars only. Prices are subject to change without any prior notice. Diamondhoops.com may terminate this Agreement and deny you access to the Site at any time, immediately and without notice, if in Diamondhoops.com's sole discretion you fail to comply with any term or condition of this Agreement. To our knowledge, all our diamonds are from legitimate sources not involved in funding conflict and are in compliance with UN resolutions. We understand and agree with the concerns regarding conflict diamonds and hereby state that the diamonds are conflict free based on personal knowledge and/or written guarantees provided by our supplier(s). This website contains links to other websites that are owned and operated by third parties. Please be advised that Diamondhoops.com is not responsible for the content or operation of these third party websites. Links to such websites have been provided for your convenience however does not imply and or constitute sponsorship, endorsement, or responsibility for the operation or content of the third party website. You are welcome to access, view and download the Content (defined below) on this Website for personal, noncommercial use only. No right, title or interest in any downloaded materials is transferred to you by downloading or copying information on our website. You agree to use this website exclusively for lawful purposes. Any comments, endorsements, suggestions, materials, or other submissions ("User Comments”) that you send to Diamondhoops.com are provided on a non-confidential bases. You are granting Diamondhoops.com the irrevocable right to reproduce, publish, broadcast, post, modify, transmit, display or display any of your user comments. However, we value your trust and will not publish any identifiable personal information (such as your name, etc.) in relation to your user comments without your consent. You agree not to submit any User Comments that is subject to a third parties property rights, including but not limited to copyright, trademark, privacy or other personal or proprietary rights. In addition you agree not to submit offensive, derogatory, obscene, libelous or otherwise unlawful User Comments. You are solely responsible for any User Comments you make and Diamondhoops.com retains the right to disclaim any and all liability in connection with your User Comments. Furthermore, Diamondhoops.com can at any time at its sole discretion decide to remove User Comments partially or entirely without notice to you. 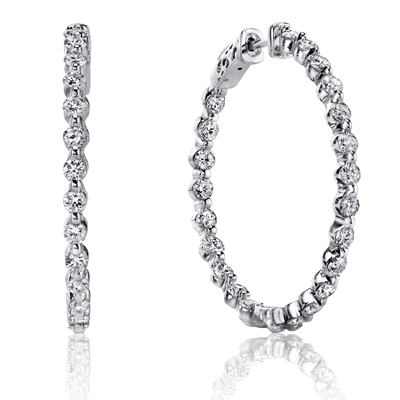 Diamondhoops.com, its website, contents and sale of its merchandise are intended solely for personal and noncommercial use unless expressly stated as otherwise. You are authorized to download or copy the content as displayed on the website for your personal use only. Downloading or copying of such material does not transfer any rights, title or interest and none of the material can be reproduced, publicly displayed, or distributed unless stated as otherwise. All content and materials at this website are copyrighted and any unauthorized use may violate copyright, trademark, and other laws. THIS WEBSITE AND ITS CONTENTS ARE PROVIDED ON AN "AS IS" AND "AS AVAILABLE" BASIS. DIAMONDHOOPS.COM DISCLAIMS, TO THE FULLEST EXTENT OF THE LAW, ALL WARRANTIES AND CONDITIONS, EXPRESS OR IMPLIED, INCLUDING BUT NOT LIMITED TO CONDITIONS OF MERCHANTABILITY AND FITNESS FOR A PARTICULAR PURPOSE. YOU ASSUME FULL RESPONSIBILITY FOR ALL COSTS ASSOCIATED WITH ALL NECESSARY SERVICING OR REPAIRS OF ANY EQUIPMENT YOU USE IN CONNECTION WITH YOUR USE OF OUR WEBSITE. NEITHER DIAMONDHOOPS.COM NOR ANY PARTY INVOLVED IN CREATING, PRODUCING OR DELIVERING THIS WEBSITE OR ANY ASPECT THEREOF SHALL BE LIABLE FOR ANY DIRECT, SPECIAL, INCIDENTAL, CONSEQUENTIAL, INDIRECT, OR PUNITIVE DAMAGES, WHETHER IN AN ACTION UNDER CONTRACT, NEGLIGENCE OR ANY OTHER THEORY, ARISING OUT OF OR IN CONNECTION WITH YOUR ACCESS, USE OR INABILITY TO USE THIS WEBSITE, OR ERRORS OR OMISSION IN THE CONTENT THEREOF, EVEN IF DIAMONDHOOPS.COM HAS BEEN ADVISED OF THE POSSIBILITY OF SUCH DAMAGES. BECAUSE SOME STATES DO NOT ALLOW THE EXCLUSION OR LIMITATION OF LIABILITY FOR CONSEQUENTIAL OR INCIDENTAL DAMAGES, THE ABOVE LIMITATION MAY NOT APPLY TO YOU IN SUCH STATES. THE RESPECTIVE LIABILITY OF DIAMONDHOOPS.COM, OR ANY PARTY INVOLVED IN CREATING, PRODUCING OR DELIVERING THIS WEBSITE OR ANY ASPECT THEREOF SHALL BE LIMITED TO THE GREATEST EXTENT PERMITTED BY APPLICABLE LAW. This exclusion and limitation only applies to the extent permitted by law and is without prejudice to any express provisions to the contrary in any written license or subscription agreement from Diamondhoops.com in respect of the use of any online service provided via this web site. 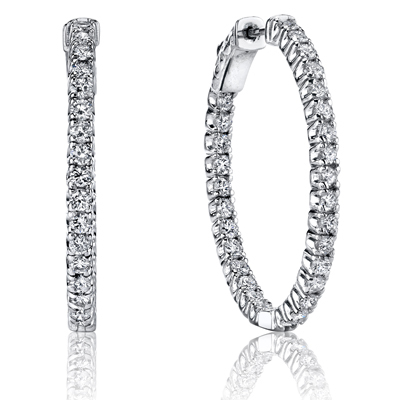 YOU EXPRESSLY AGREE THAT ACCESS TO AND USE OF DIAMONDHOOPS.COM AND THE CONTENT THEREOF IS AT YOUR SOLE RISK. This Agreement shall be governed by, construed and enforced in accordance with the laws of the State of New York. Any dispute arising under this Agreement shall be resolved exclusively by an appropriate federal or state court sitting in the State of New York. Diamondhoops.com may terminate this Agreement and deny you access to the website at any time, immediately and without notice if the website unilaterally decides you fail to comply with any term or condition of this Agreement.